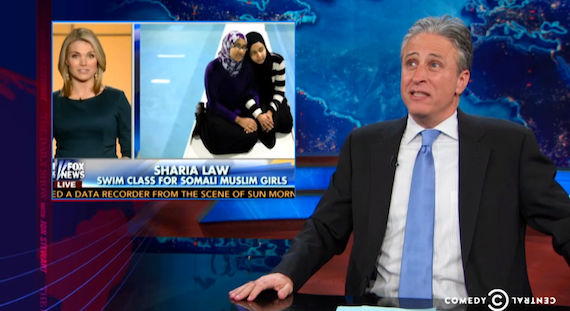 Jon Stewart has discovered the most horrible thing in the world on Fox Cable News. A YMCA in St. Paul Minnesota has set aside an hour for Somali Muslim women to swim at the pool, no men allowed. Actually gender-segregated swimming is quite common and is an accommodation also made for some Jewish Americans and other groups. When municipal swimming pools first began in the early twentieth century, men and women swam on different days. Fox wants to go back to the days of the robber barons in every other way, why not this one? It bears repeating that Fox Cable News, despite its profitable Islamophobia, is part-owned by al-Walid bin Talal, a Saudi prince. Stewart also has more fun with the right wing ‘war on Christmas’ meme, which seems mainly an attempt to make Jewish Americans into Christians.